Three animators respond to the music of Katy Abbott’s symphony Introduced Species. Excerpts from movements 2 and 3 are heard here. Paul Fletcher, Robert Stephenson and Thom Fraser use different styles of animation to capture the intention of the music. The music takes its original launching point from a painting by artist Matthew Quick, Intrepid Travellers (2010) which depicts the 1992 event when almost 29,000 bath toys fell from a cargo ship travelling from Hong Kong to USA. 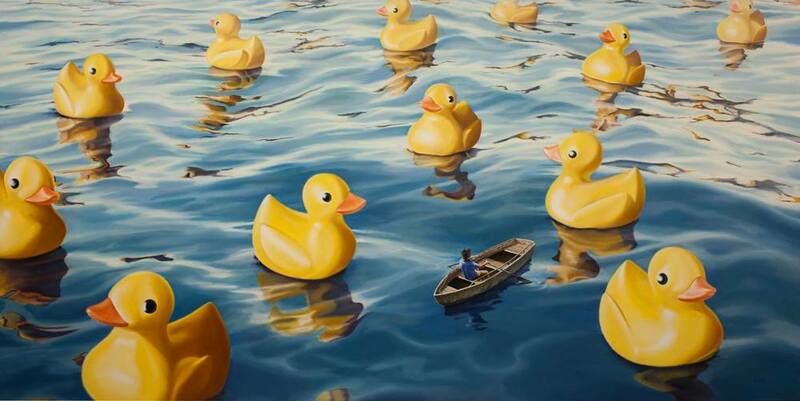 Movement 2 (Plummet) depicts the rubber duck bath toys falling from the ship amidst sun and glistening sea-spray. Movement 3 (Trash Vortex) references the ocean garbage patch in the North Pacific Region which is host to an enormous amount of the world’s rubbish / trash. For more information about the musical work Introduced Species including a free download of the analysis of Introduced Species, please visit ‘Resources’ or 'Introduced Species' at here. I'll be posting some resources on this page occasionally. To begin, here is a 30+ page analysis and process diary for secondary classroom use to accompany Introduced Species. It was commissioned by Melbourne Symphony Orchestra. The teacher resource document, is an in-depth look into the work, the compositional process and provides relevant active listening and composition activities for the classroom. The document has a various functions and could be utilised by way of familiarising students with the piece before the performance or as a resource for extended study in analysis and composition following the presentation and performance. The resource can be 'dipped into' as required or used as a whole. Extra-musical topics include sustainability, creating intention and visual art and its relationship to music. Click HERE to download. Upcoming performances in schools are with Melbourne Symphony Orchestra in March 2015 and with Tasmanian Symphony Orchestra in Hobart in June 2015. Details on the Events page. The score is available for purchase or hire through Australian Music Centre. 'Intrepid Travellers' (2010) from Matthew Quick's series Introduced Species. Taking inspiration from watching artist Matthew Quick design and paint this work, as well as the story behind it, my orchestral work for Melbourne Symphony Orchestra began to take shape. Matthew Quick has painted a series of incredible works titled Introduced Species depicting beautiful backgrounds with arresting and juxtaposing 'introduced' images which tell an often complex story. My work, alongside the background story to this painting, explores the Trash Vortex (North Pacific Garbage Patch) in the context of the near 29,000 bath toys that fell from the Ever Laurel cargo ship in 1992. The piece was premiered this year by the MSO / Dollman and also introduces various 'extra' elements to the music.